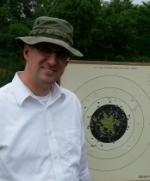 22 Match: John has been shooting a Marvel conversion for the last year and is using Lapua Center X ammo. Slow 98-2, 99-8, Total 197-10. NMC Slow 99-5, T 100-8, R 98-4, 297-17 Timed 100-9,99-8 199-17, Rapid 100-9,100-8 200-17,893-61. Center Fire, Using a Marvel 45 with Zero Ammo, Slow 99-4,100-7 199-11 New( Record ), NMC 97-0,100-8,100-6 297-14, Timed 100-9,100-8 200-17, Rapid 99-6,100-8 199-14 895-56, ( New Record ). 45 Match: Slow 97-3, 99-2 196-5, NMC 95-5, 100-7, 100-7 295-15, Timed 100-6,100-9 200-15, Rapid 100-6,100-9 200-15 891-50, 2700 Agg. 2679- 167X. ( New Record ) A Job well done! WOW....I'm lucky if I don't drop 21 points on 1 target!!! Holy Crap! Smokin....That is some awesome pistola shootin.....I'd be jealous if I was even remotely close to that level performance ..but since I'm not I'll just look at it for what it is .....Awesome....!!!!!!! John has earned his way there the hard way. Years and years of practice. Can anyone provide any background on John? I know he won the President's last year. Other than that, almost anything would be insight. John is a heck of a nice guy. Met him a couple times at Perry. Congratulations to John. Where was this match?